Like previous occupants of the East Wing, Barack and Michelle Obama have had to struggle with how much to reveal about their children Sasha and Malia. So for the Obamas' press advisers, the getting-a-dog story must have seemed like a sweet spot: homey but not intimate, involving the girls without compromising their privacy. Actually, the dog story began long before the Obamas moved into the White House. In October 2007, according to the Chicago Sun-Times, Michelle Obama said, "[The girls'] main concern about this whole race was whether or not they could get a dog. That was their bargaining chip. It's like, 'You want to run for President; we're getting a dog.' And let me tell you, we talk about that dog every day ... What breed, how big, how small." After Obama was elected, speculation grew as to what kind of dog the family might get. In newspapers as far away as New Zealand, reporters covered questions like whether it should be a stray or a purebred. 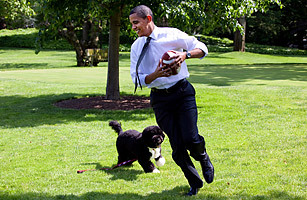 Finally, in April, Senator Ted Kennedy gave the Obamas a purebred male Portuguese water dog that Kennedy's dog handlers had personally trained. The girls gave him the rather effeminate name Bo, partly because they have cousins with a cat named Bo. Hopefully, the poor little guy  who has now been neutered in more ways than one  will never learn he was named after a cat.